actor/author Jim Beaver reminds us why this man is still so fondly admired and remembered. January 5 is the 100th anniversary of the birth of actor George Reeves. Those of you who know me well probably know I've been working on a definitive biography of Reeves since somewhere around the 64th anniversary of his birth. Those of you who know me really well surely know the anguish with which I mention that project's astonishing delay in completion. When I started this labor of love, I was making about $50 a year as an actor and had plenty of time on my hands to write and research. Little did I dream that a few decades later, I would have had substantially more time in front of a movie camera than Reeves had in his entire career, or that my life would fill up so full with blessings (and a few tragedies) that even a labor of love could be delayed so long. I had sincerely hoped to have this book completed and available for reading by Reeves' 100th birthday. How happy that would have made me! Yet it isn't to be, and the stories I've gathered will have to wait until, at long last, I complete the task I'm committed to completing. But I can't let this anniversary pass unnoticed. George Reeves has been dead for nearly 55 years, but he's not completely forgotten. As long as baby boomers remain alive who remember tying towels around their necks and drawing S's on their t-shirts and running home to watch the Adventures of Superman on their black-and-white TV's, he won't be forgotten. For a dwindling (and comparative) few, he is their Elvis, their Michael Jackson, their John Wayne, despite never being nearly the household name for millions that those icons are. 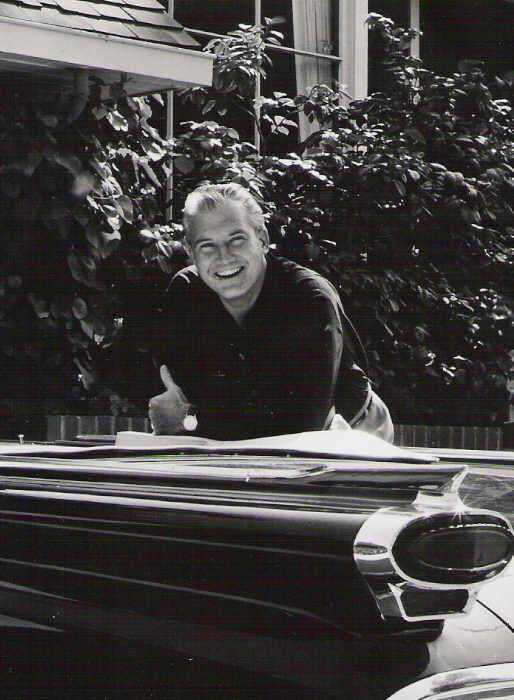 I've often been asked during my researches, even by people who knew him, "Why George Reeves? Why write a book about him?" And the truth is, had he never stumbled (and I use that word advisedly) into the role of Superman at the beginning of the television era, he would surely be no better remembered than various other handsome young men who had minor careers in movies. John Ridgely, Rand Brooks, Robert Lowery, Richard Travis -- all capable actors, nice-looking fellows with substantial film credits, yet now forgotten by everyone but Golden Age movie buffs and fans of specific films they appeared in. Reeves could well have been one of these, but for Superman. Or he might have been a Gig Young or a Jack Warden, an Oscar-caliber player with a long career in the shadow only of superstars, had Superman not sent his career (and his life) along a different track. As it was, though, Reeves remains of interest largely to fans of his show, to film buffs of the more in-depth sort, and to mystery enthusiasts who wonder about the circumstances of his death. Even his friends sometimes questioned why I would want to write a book about him. All I know is there's something about the man and his life that fascinates me, that drives me to know him better, and that instills admiration. He was an average actor, from the evidence available. He was quite capable of very good work, yet nothing we can see suggests the range or depth or style of an Olivier or a Brando or a Mitchum (nor the opportunities they got). It's said he was quite a good stage actor, but few there are now who can attest to that first-hand. In films, even his best director, probably Fred Zinneman in From Here To Eternity, realized nothing astounding from him (though, admittedly, little Reeves ever did on film could be considered a truly meaty or artistically complex role). Nothing makes George Reeves particularly special as an actor. Nothing except... him. The Adventures Of Superman was a fun show, but we're not talking Breaking Bad here, or The Sopranos. It was a show that had some appeal for adults but was mainly designed as entertainment for children, who ate it up with a shovel. In all probability, the show would have had its success even with another actor in the title role. And yet, it didn't. It had George Reeves, for his better or worse fortune. And he brought something to the part that lingers, something that even his colleagues among the baby boom's childhood heroic icons (The Lone Ranger's Clayton Moore, Zorro's Guy Williams, et al) couldn't compete with. Superman fans didn't just admire Reeves in his portrayal, they loved him. More importantly, he gave them a sense that he loved them. More than talent, more than appearance, more than any other gift, Reeves' ability to connect through the camera to his young audience transcends his role and the work of others in the genre. Reeves' natural geniality and warmth, something remarked on by virtually every single person I ever interviewed, reached out through the lens and washed over his youthful followers in a way that lives with them still in their older years. That warmth, combined with the melancholy associated with his untimely death, puts George Reeves in a very special place for an awful lot of people now in their 60s and 70s. No, he hasn't the world-wide absolute familiarity that still clings to Marilyn Monroe and James Dean. But for some, maybe only hundreds or thousands rather than millions, he is a far bigger star and a far bigger role model. As I've reached a point in my career where generosity is something I'm able to offer instead of ask for, I don't believe I've ever considered a loan or a gift without the memory of reading in my youth how widely known George Reeves was for his generosity. In the years since, in my research, I've encountered hundreds of people who told me how he helped them, privately, without fanfare or expectation. He was, once he achieved real fame, unstinting with his time for charitable causes. Without consciously modeling myself on him, but without ever failing to think of him when confronted with the opportunity or challenge to be useful, he has been a role model for my own life. His reputation among friends and colleagues for cheerfulness and gregariousness and loyalty colors my own approach to people. No, he's not the only light I illuminate my life by, but he's one of the brighter lamps. In the decades I've researched his life, I've usually always enjoyed his work and appreciated his talents as far as they went and as far as they were well-displayed. But what has always drawn me to him and to his story has been the innate goodness of the man. He could be wild, he could be bawdy (sometimes very bawdy), he was a two-fisted drinker and not always a responsible one. His life was in some aspects far rowdier and profligate than the straight-up character he's most famous for playing, yet he loved life and he loved people and he did his utmost to show that love and to act on it. So whether he could out-act Gielgud or whether he's as famous as Elvis is beside the point. I started out researching the life and death of the guy who played Superman on my favorite childhood show, and came to realize I was really finding out some things about how to live, through the life of a man who was pretty good at it. The facts of how Reeves died are just that, facts. The interpretations are as many as there are interpreters. There's some mystery, in the sense of there being things no one seems to know, but even if every single thing were known, there would always be wide division as to what "really" happened. The circumstances of Reeves' death are important to his biographer, and I've done wide-ranging research into them. But I want to pause here to celebrate on a significant anniversary the birth of a man I long ago ceased to be simply a fan of, one I've grown to care about as a human being, one I've come to look up to and look to for example. I don't idolize George Reeves. I admire him. And that seems quite the right way for this old baby boomer to see his childhood idol. I won't deny having a little influence on the fact that Turner Classic Movies is celebrating Reeves' 100th birthday with four of his films, Sunday, January 5. They're not great films, but two of them represent Warner Bros.'s early attempts to see how George would work out as a leading man. The final one is fun, but silly, the sort of work Reeves really hoped to get away from and never quite did. But I'm really grateful to TCM for setting aside this little bit of time to honor an actor and a good man, less forgotten than some might think, more forgotten than he should be. Here's to Honest George, the People's Friend.